It was amusing to read on the train on the way into work this morning about the South African firm who pitted a carrier pigeon against their broadband service from their local ADSL provider to see who could get 4GB of data to travel 60 miles between their offices quickest - and that the pigeon won hands down, as it arrived with its memory stick when the file was only 4% through its comparable electronic transfer. This is an example of a great way to compare old tech with new tech, and also to make the point to their ISP in the process - although the ISP has said that the company in question has not undertaken any of the service improvement ideas they have recommended to speed up their slow broadband connection. 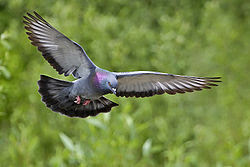 One of the boffins in our PR team decided to compare this with a download over our 50Mb broadband service, and have reported to TechRadar that the pigeon would need to travel at almost 330mph in order to keep up with our 50Mb in comparison! And that's one heck of a fast pigeon, much faster than the fastest bird recorded, which is supposedly the Spine-Tailed Swift - which can reach an impressive 171km/h (just over 106 mph apparently). Did your 'boffins' consider that the upstream is only 1.5Mb on this service? 50Mb downstream sounds so much better though. There's no traffic management on 50Mb, and they did talk about the time to download it! I liked that the original article talked about no interference from cats or birdseed - made me laugh out loud on the train!